1. I've learned that my fear of taking off in an airplane has vanished. Last week, I flew 8,226 miles to North Carolina and back. That meant I had eight different take-offs, including the bumps, jostles, and feeling of falling out of the sky they include. Fear used to be a major player in my thought life. I was afraid of intruders, someone I love dying, kidnappers, and airplane crashes - especially if I'd left my whole family at home and was sitting on an airplane alone. It seemed to sit better if we were all together, like if we all went down, we ALL went down - and that'd be dandy, right? Well, not really. Fear was gripping me, and that's never good. About a year ago, I had a shift. A monumental shift in my thought life. Fear was replaced with trust, trust led to peace, and peace led to loving this new habit. Because changing the patterns of your thought life does include hefty doses of habit and scores of prayer. Enter the girl who didn't fear a single take-off. 2. I learned that I have an inexplicable love for spiral-bound notebooks. Is anyone with me on this? Doesn't a fresh notebook make your heart soar? It has so many possibilities. One could hold your shopping lists, be a prayer journal, serve as the place you jot down your Gifts, big ideas, blog post brainstorms, conference or sermon notes, and funny things your kids say. I have notebooks for all of these purposes. What do you use your notebooks for? 3. Even toy cars desire a loving marriage. I came upon this scene on my kitchen island recently. Two cars were ready to take the plunge and walk down the aisle toward marital bliss. Complete with a toilet paper aisle runner and tulle and toilet paper veil. Hopefully they're open to working on their communication without believing the worst about the other car. Giving each other the benefit of the doubt will work wonders in their new union. Especially when the blue car makes a comment about the size of the pink car's trunk when she's pregnant with a wee car. 4. It is possible to love a box of tissues. After traveling last week and sitting next to Mr. Hacking Cough on a long leg of my trip, I came down with a nasty chest cold that set in as we arrived at the hotel. I was determined to have a good attitude (it was quite inconvenient to be sick at Disneyland) even though I was feeling poorly as the pre-conference sessions commenced. I ended up buying a couple boxes of these bad boys and fell in love. You must snag some for yourself next time you're sick. It's the same kind of love I have for my thesaurus. The one that I may or may not have hugged. 5. Poppies make me smile. 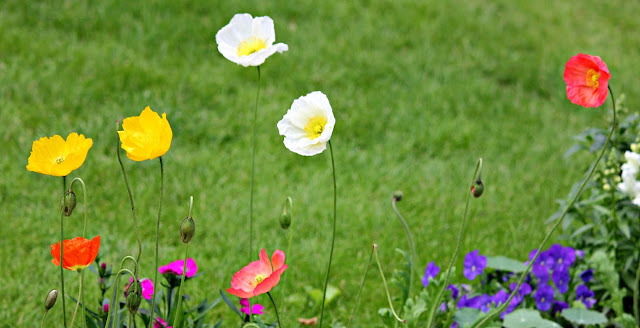 At the start of summer, when I was planning which flowers I'd plant along the path leading to our front door, I knew poppies would be involved. Now that the plants are mature, and the flowers abundant, I'm more in love than ever. There's just something about those papery blooms sticking up above the crowd with no leaves getting in the way that makes them so special. 6. I learned that I want to make God's Word known. I came across a scripture that encapsulates my heart as I seek to encourage women along the road we're traveling together. 25 I have become its servant by the commission God gave me to present to you the word of God in its fullness— 26 the mystery that has been kept hidden for ages and generations, but is now disclosed to the Lord’s people. I've linked up with this fabulous bunch who share what they've learned each month (silly or serious) over at Emily Freeman's blog, Chatting at the Sky. Pop on over and see what they learned in July! 15 comments on "6 things I learned in July"
You've encouraged me already and it's just the first day of August. I'm a consummate list maker so I love your list, especially number 6. I love number 5 as well because I love flowers...all kinds. 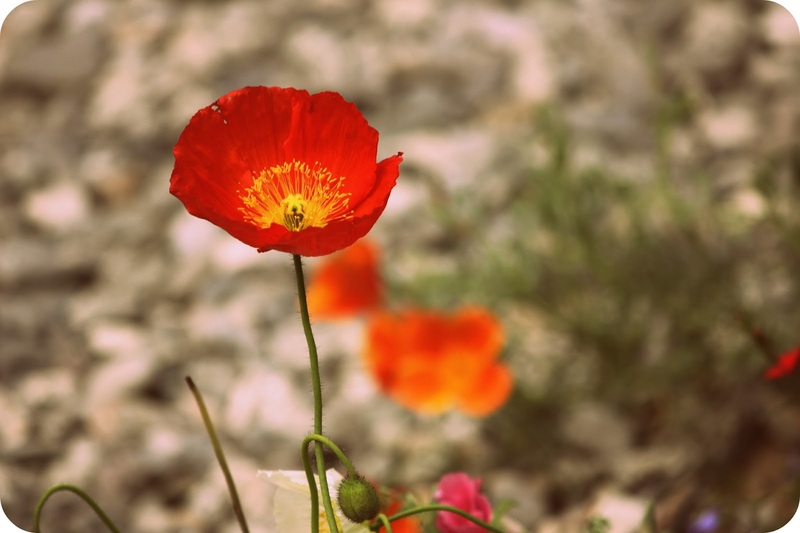 I can just see your smiling face as you gaze upon your poppies! I was a joy to meet you and get to know you, Cindy! 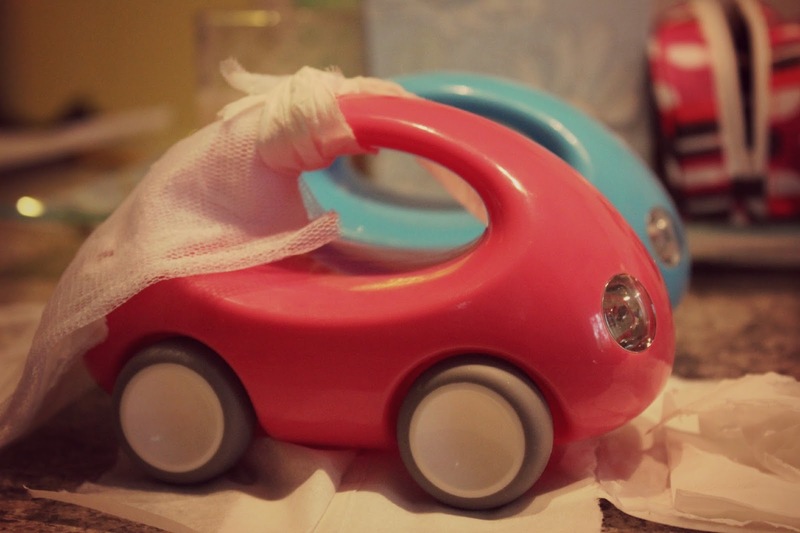 I loved the part about the toy cars getting married. That one made me smile. I love the special touch with the vale (spelling on that?) on the pink car. May they have many happy years together:-) Thanks for sharing. haha, isn't that car wedding so touching? What a great verse and what an awesome desire to make God's Word known. ...and I adore what the blue car said about the pink car's trunk. Aww. What are you going to use that hidden treasure of a notebook for??? Spirals, journals--fresh pages of hope, anticipation, and wonder! What a delightful post. 1) What a testimony! 5) Me, too! So Wizard of Ozish. Love. Happy, happy, happy. 6) Wonderful! Pleased to make your acquaintance via Chatting at the Sky. I love spirals especially ones with dividers and maybe a pocket. Especially loved #1 and #6. Stopping over from Emily's. #2 ok, so now you have made me want to go out and buy spiral notebooks! #5 The poppies are beautiful - I always think of the Wizard of Oz when I see poppies- so now I want to watch that as well! #4 Tissues are a deeply personal thing - my brand of choice is plain old kleenex - I have a lot of eye irritation, so can't use the lotion and they are the only brand that don't seem to leave lint on my eyes. Yes, I love my tissues :)#1 - I have never flown. fear. don't know if I can overcome it. would love too. #3 - too cute and #6 Love your heart. and,Obviously I can't count in sequence. I found you via Chatting at the Sky. Enjoyed the visit.